Set in the south east of Nigeria, 223 Bonny Street is a story about surviving loss, finding your identity and making connections. After an accident, waking up in another person's body seems like a dream until Ikenna realizes that he is faced with the stark reality of Nkechi’s life, the woman whose body he occupies. He experiences the pain and joy, strength and sacrifices of a woman. The two of them make a connection beyond the physical, but matters of the heart are delicate. When secrets from the past are revealed, will their connection be strong enough to survive? “Nkechi! Why did you scare us like that? I have told you, you have to be strong”, the frail looking old woman, who had helped him get up, spoke. Looking at her again, he tried to remember who she was. “Okay ma”, he replied, whilst still struggling to get to grips with the whole situation. Swallowing his question, sensing that this old lady wasn’t to be questioned by anybody, he remained puzzled. Looking at the chair he was sitting on, he realised this wasn't his favorite army green reclining chair, where he sat in the evenings watching football, with strict house rules that nobody else was allowed to sit on his chair, not even the president. Turning to his left, he saw a group of men, who looked like they were in their mid forties or early fifties, and what struck him was that they were all wearing black, and they looked his way, speaking amongst themselves. “Please, what are these men doing”, he asked the young lady who was standing by his side. Looking at him rather strangely. “They are discussing the burial preparation of Godwin”, she whispered. “Who is Godwin?” he asked, as he watched the blood drain from her face. Whispering something he couldn't hear to the old frail looking lady, she turned to him. Taking his hands in hers. “Come with me”, she ordered. Still not settled after what had happened to him, Ikenna obliged. Allowing himself to be dragged as they walked into a dark room, she switched on the light and shoved him in front of the big standing mirror. “Look at yourself properly in the mirror, before you ask me that rubbish question again, about Godwin”. 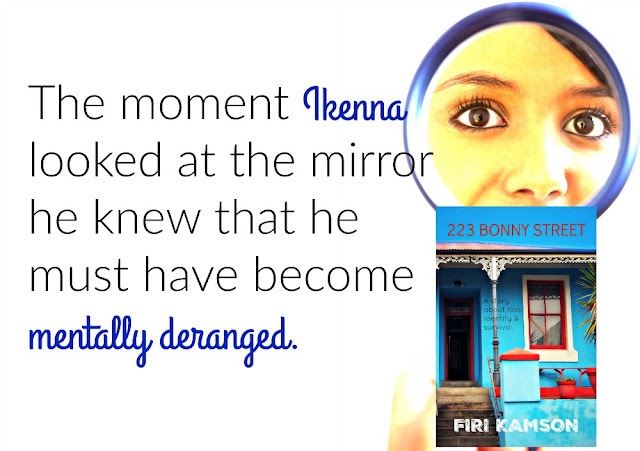 The moment Ikenna looked at the mirror he knew that he must have become mentally deranged. What he was looking at was the face and body of a woman. A woman, who had aged overnight, even though she was relatively young. She was of average height, had a round face, full bosom, but the bottom line was that he was a woman and was pregnant. Turning around, as he looked at the lady, he muttered, “Who is this? Is this a joke?” Glancing at the mirror again, he touched his skin. Firi Kamson was born in Nigeria, where she grew up. Becoming a lawyer, a writer and a pilot was her childhood dream, she dropped the lawyer part and got a B.A. in foreign languages and literature specialty French. Worked as a freelance translator and a photographer for a couple of years before she decided to explore the creative world of writing. She writes a column for www.sabinews.com, as Tee, an online Nigerian based magazine, where she journals her experiences in South East Asia. The dream of becoming a pilot is still there and who knows one day it would be fulfilled. She lives in South East Asia with her nerdy husband and very active daughter and son. Ere's Secret is her first work.